Hey, folks! I’m here now for my first SMITE weekly update. For those of you who aren’t familiar of SMITE yet, this is another MOBA game like DOTA 2 and League of Legends. What sets SMITE apart from the other MOBAs is that while playing, the camera is in a third-person view ( instead of the traditional isometric view (where you watch them from above). As expected, the top squad of the entire Oceania division is going to dominate Avant Garde once again. They’ve beaten them fair and square in their first encounter, and they’ve done it again here in the second split. As the second-seeded team in the Oceania division, Legacy Esports proved once again that they could dominate other crews. It all starts by beating Dark Sided, 2-0. The only threat that they have for now is the mighty LG Dire Wolves. However, they don’t have to worry about them until Week 5. They have to get past Team Noxide in Week 2. Kanga got off to a hot start by defeating cellar-dweller Team Noxide, 2-0. In the last tourney, Kanga Esports were ranked second to the last in standings. They have defeated Noxide in the last tournament, and they make sure that they’re going to beat them again. This is a surprising game for both teams. In the first tourney, the LG Dire Wolves end their campaign as the top squad with 10 wins, no losses and draws. In SMITE client where I could pick teams to win their own battles, I usually pick LG Dire Wolves in the entire 5-week schedule. However, it seems that the LG Dire Wolves are not almighty. I was so confident that the LG guys are going to remain unbeaten in the tournament, until Dark Sided surprised them with at least a win in the series. In the end, it’s a split decision at 1-1. It’s the first time this season that LG Dire Wolves have tasted a draw. Looks like Dark Sided has exposed each player’s weakness in one game. Last tourney, Kanga Esports defeated Avant Garde fair and square. They’ve done it again here in the second split, and it seems they’re a hot team right now. As for Avant Garde, the so-called “Average Joes” aren’t expecting a slow start for their team. Now they’re tied with Team Noxide at the cellar-dweller spot at 0-4. Legacy Esports continued their momentum in the 2nd split at the expense of cellar-dweller Team Noxide, 2-0. Right now, they’re tied with Kanga Esports for the top spot in the second split. As for Noxide, they still have to figure their own identity. Just like the last tournament, Team Noxide ended up winless. It looks like they’re on their way to another winless campaign, as they have tough matches in the final weeks of the tourney. Who would have thought that Kanga Esports are off to a hot start? After finishing second to the last in Oceania Pro League 1st Split, they’re now at the top of the standings. It means that they have figured it out in playing with each other. However, they still have yet to prove to become the best in this tourney. Last tourney, they are defeated by Legacy Esports and the mighty LG Dire Wolves. They still have 3 more weeks to prove that they are real contenders for the competition. They need to get past LG Dire Wolves and Legacy Esports for that. In this patch update, you’ll see new skins, emotes, avatar, god achievements, event, god and item bug fixes, god changes and other features that need to be balanced. Without further ado, here are the latest features of the SMITE 4.8 patch. * Bob Ross Sylvanus – This is the highlight of the entire patch. 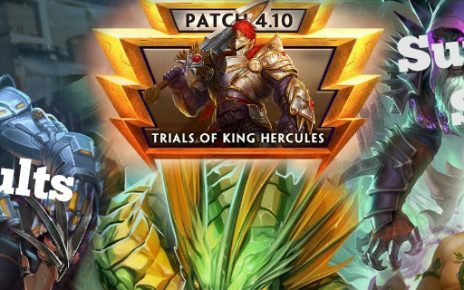 The reason why Happy Trees is named for this patch is because of Sylvanus’ new skin. I think you can buy this as a bundle because it includes his Bob Ross Sylvanus skin, a customized loading frame, new loading screen, and a Paint Splatter jump stamp that catches my attention. * Queen’s Order Erlang Shen – It’s an exclusive item and you won’t buy it for 400 to 600 gems. I love the Welsh Corgi dog. * Cosmic Sol – Pretty similar to Agni’s cosmic skin. You can get this item for free once you reach Level 20 in S4 ticket by gaining Fantasy Points (FP’s) along the way. * Vizier Thoth – I kind of like this stuff for Thoth. He’s one of the strongest mages I’ve ever seen, and this skin alone is sick and awesome. * Honorbound Kuzenbo – You can buy this skin for 250 gems. He looks cool in this outfit. He has no upper tier skin yet that fully customize his appearance and voice pack. Looking forward to that. * Obey Thanatos – Awesome look for Thanatos, especially for fans of Obey Alliance. Major item and bug fixes are also been done in this patch. Item and god changes are also implemented to balance things up. Some of them are nerfed, while others are buffed like Sun Wukong’s increased physical power scaling and Ares’ increased base physical protection. This is all for now. Be sure to come back for more intense SMITE action next week. It has been wild and crazy for all teams in the tournament, and expect that they’re going to bring it more in the upcoming battles. Good luck!